TNSSA members will receive $30 off the Seminar-Track Package OR All-Access Pass. Please e-mail melissa2911@gmail.com to confirm your membership and to get the link to receive your discount. *Discount is available to qualified attendees only and cannot be used by vendors/suppliers in the self-storage industry. Offer expires March 31, 2019, at 11:59 p.m. MST. Registration is non-returnable and non-transferable. Offer cannot be applied to a existing registrations. 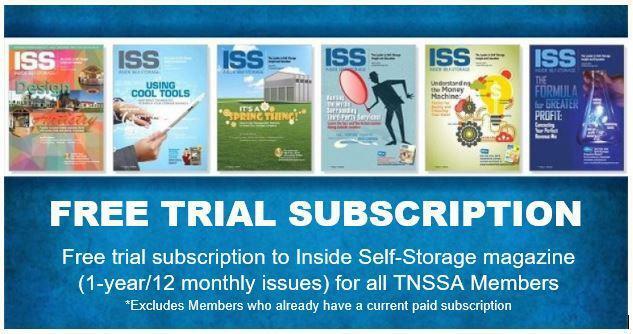 Free trial available to TNSSA members only, exclusions apply to those who have a current paid subscription.